Gibson ES-295 Model Arch Top Hollow Body Electric Guitar (1954), made in Kalamazoo, Michigan, serial # A-18024, gold lacquer finish, laminated maple body; mahogany neck with brazilian rosewood fingerboard, black hard shell case. This is a fairly well-played but still great-sounding example of one of Gibson's all-time flashiest arch-tops, the ES-295. Finished in gleaming gold overall with a cream-colored floral decorated pickguard, the 295 has been long been one of the most iconic guitars of the 1950s. The model is equipped with double P-90 pickups with cream plastic "dog ear" covers and the classic four-knob tone/volume control array with amber "hatbox" knobs and switch tip. The top is triple-bound; the back and fingerboard are single-bound. The 19-fret rosewood fingerboard has double parallelogram inlays, and the headstock has a pearl crown and "Gibson" inlay. The guitar features gold-plated hardware including the Kluson Deluxe tuners with amber keystone buttons and adjustable patent pending "Les Paul" trapeze style bridge/tailpiece. This unit is a defining element in its powerful tone, giving the 295 noticeably more ring, cut, and sustain than its more sober sister the ES-175. Other than this solid metal bridge unit, the ES-295 is essentially a flashier ES-175D featuring the same laminated maple body and mahogany neck, but with the more eye-catching finish of an all gold Les Paul. Gibson built a total of 1,770 examples of this model between 1952 and 1958, and they remain one of the company's most recognizable 1950s classics. This particular guitar dates to fall of 1954; one of 357 sold in that year, the model's second most popular year. The ES-295 was discontinued not long before the end of the 1950s, and remains fixed in that decade in the popular imagination. In rock'n'roll history the ES-295 is revered as the guitar played by Scotty Moore on the earliest Elvis Sun records, and thus often considered the ultimate Rockabilly guitar. Moore's instrument was a 1952 model practically identical to this one. The much-reproduced classic 1950s Ersel Hickey photo that epitomizes the Rockabilly aesthetic features him posing with an ES-295 and drape suit, the quintessential rockin' bopper. The all-gold showboat ranks along with the orange Gretsch 6120 as the quintessential "Cool Cat's" guitar, while also being a Populuxe '50s icon and a great-playing/sounding instrument to boot! Overall length is 40 3/4 in. (103.5 cm. ), 16 1/16 in. (40.8 cm.) wide at lower bout, and 3 3/8 in. (8.6 cm.) in depth, measured at side of rim. Scale length is 24 3/4 in. (629 mm.). Width of nut is 1 3/4 in. (44 mm.). This well-gigged 295 shows some typical wear but retains its original finish and hardware. The finish is mostly all gone from the back of the neck, which is down to the mahogany. 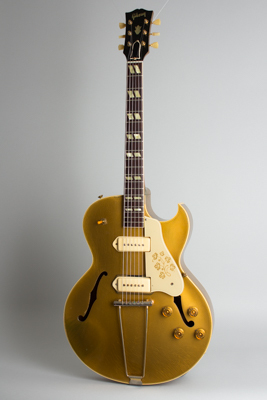 This is very common on these all-gold 1950s Gibsons as the metallic lacquer reacts to the player's hands, turning green and flaking without too much provocation. The rest of the guitar's finish shows some typical checking, with light discoloration in the armwear area and some chips and areas worn off on the edges and a small chip by the side of the switch. There is a small typical repair to the side by the jack, with some topical gold overspray added. A strap button has been added to the side above the heel. All hardware is otherwise original and remains in good shape with some expected wear to the gold plating, mostly the tailpiece. There is a small hole drilled in the tailpiece baseplate, likely related to re-attaching a ground wire. The original fairly thin frets are in better shape than one might expect, and this is still a fine player. This all-gold beauty looks great, sounds great, and is worn in enough to still be a gigging Rockabilly machine -- or just about anything else! Excellent - Condition.